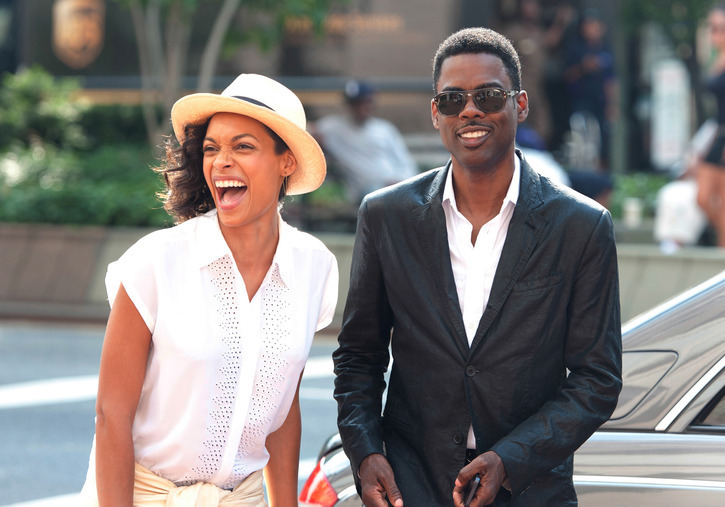 Its been seven years since Chris Rock directed a feature film (2007’s I Think I Love My Wife) but he’s back with his newest film Top Five – and he’s back in a big way. Rock plays Andre Allen, a successful comedian turned film star trying to make a transition into more “serious” movies. While doing press for his Haitian slave revolt film ‘Uprize’, Andre is shadowed by New York Times critic Chelsea Brown (Rosario Dawson). During the almost day long interview, Chelsea ask about Andre’s personal struggles, they visit with his family, and run errands for his upcoming wedding to reality star Erica Long (Gabrielle Union). Comedy is always the main ingredient in any Chris Rock film, but this time around he’s sprinkled in a nice romantic story and a satirical look at a day-in the- life of a comedian/movie star. It’s impossible to watch the film and not think about how much of what you see happened to Rock or his fellow cast members. The strength of Top Five is the perfect balance between its two leads, Rock and Dawson, and its multiple supporting roles. Rock is believable as a comic turned movie star because, in a lot of ways, he’s playing character a lot like himself. Dawson’s performance reminds moviegoers how great of an actress she is and her ability to play complex characters. Rock’s decision to have skillful comedians in the film’s supporting roles is what gives the movie life. If Rock and Dawson are Top Five’s heartbeat, the supporting casts is the blood that keeps the heart pumping. Kevin Hart, Tracy Morgan, Cedric the Entertainer, J.B Smoove, Leslie Jones, Jay Pharoah, and Michael Che add their comedic talents to the film. The film manages to be predictable but not typical. It’s a refreshing story because it doesn’t hit the usual beats, yet somehow delivers all of those same notes. The story doesn’t offer a bunch of surprises, I guess Rock saved all his surprises for the film’s cameos – there a two A-List cameos that are as enjoyable to watch as they are comical. Top Five isn’t just a comedy. Trust me, it’s funny – I almost forgot how funny Rock can be. He starts with gut-busting jokes as soon as the film starts, and he never stops. The jokes keep coming one after another. There are quick bits, running jokes (courtesy of J.B Smoove), callbacks, flashbacks, and even a little stand up. The film is also very touching. Throughout all the laughs, Rock still finds room to talk about family (a touching scene with Ben Vereen), friends, love, and happiness. It’s those moments that help glue the film together and make you care about the characters you see onscreen. This is by far Chris Rock’s best movie to date and one of the funniest film of 2014. After a string of films that seem to miss their mark, Rock hit his bullseye with Top Five. Well done Mr. Rock, well done. Posted in Reviews and tagged Ben Vereen, Cedric The Entertainer, Chris Rock, comedy, Gabrielle Union, Grade: A+, Hayley Marie Norman, I Think I Love My Wife, J.B Smoove, Jay Pharoah, Kevin Hart, Michael Che, Romany Malco, Rosario Dawson, Top Five, Tracy Morgan. Bookmark the permalink.